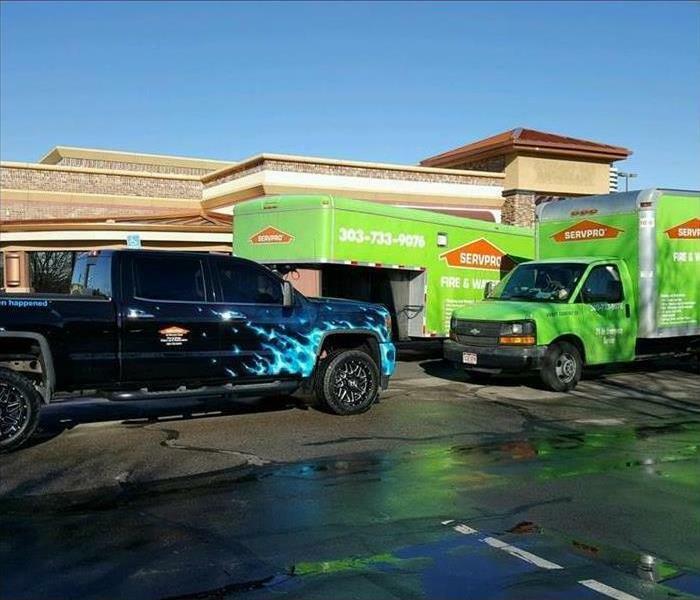 SERVPRO of Englewood/East Littleton hard at work! 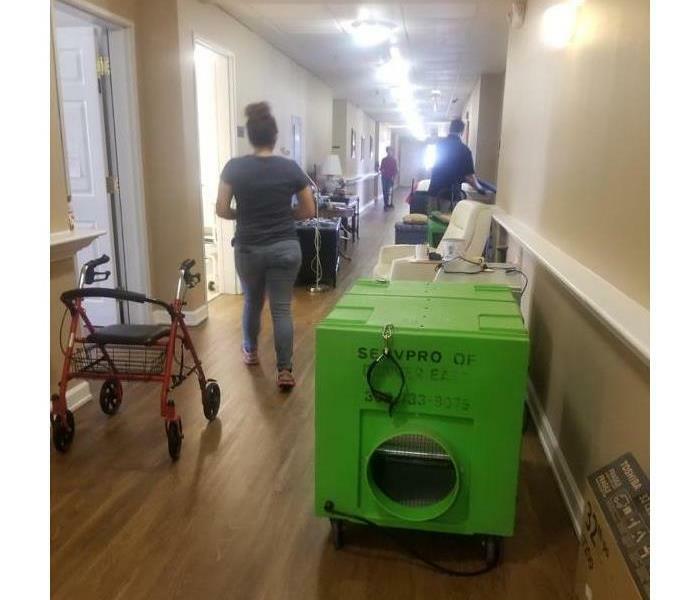 We responded to this retirement community that had standing water expanding its entire first floor. We arrived on site ad started the process of extracting the water and properly drying the area. 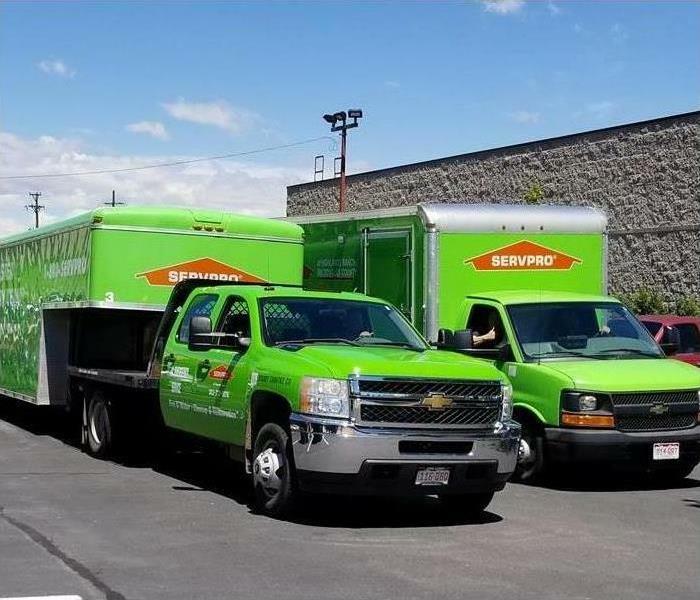 Our team here at SERVPRO of Englewood/East Littleton is always ready and willing to respond to any size job at any time. We have 24 hour response teams ready and waiting to come to the rescue! 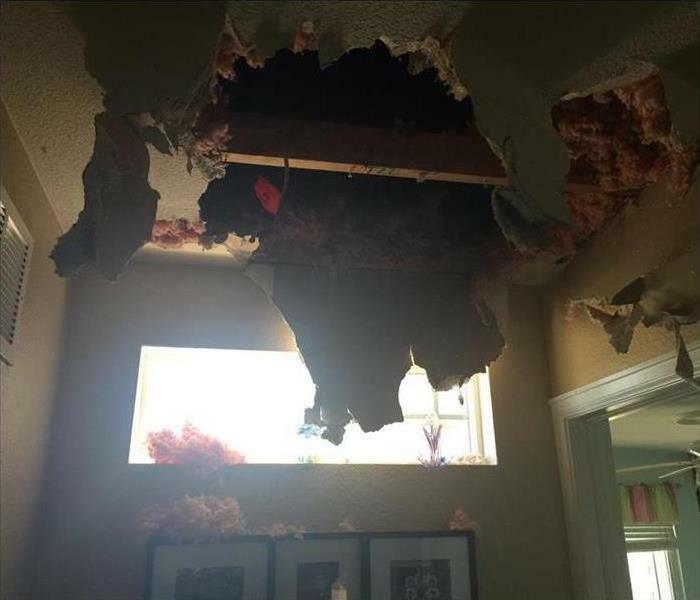 This home suffered from significant water damage from a pipe break in the wall. 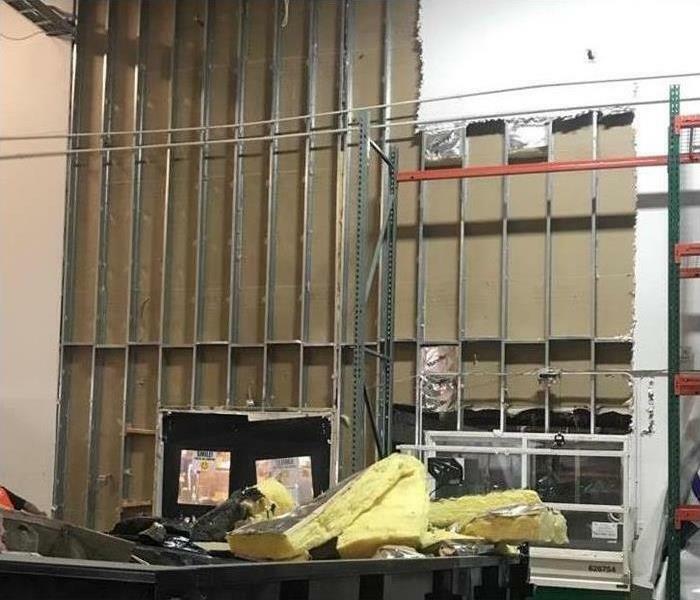 Drywall was tore out finding the water dripping. 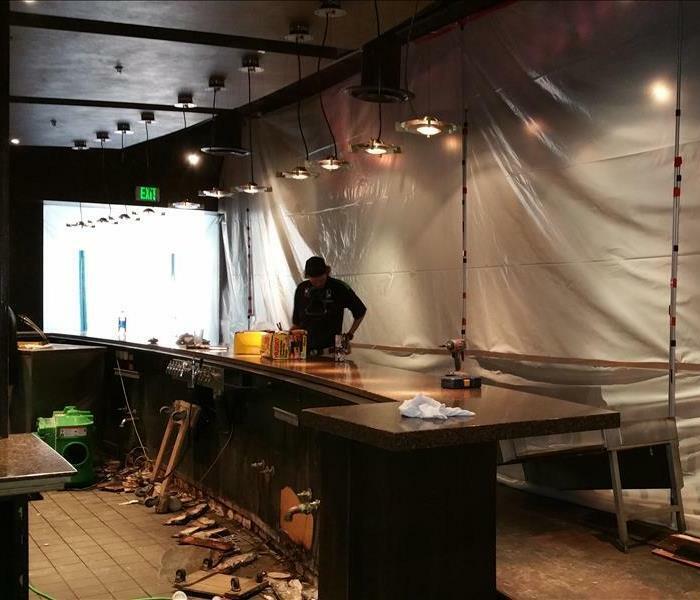 The drywall was damaged and removed and put back restoring back to normal conditions. 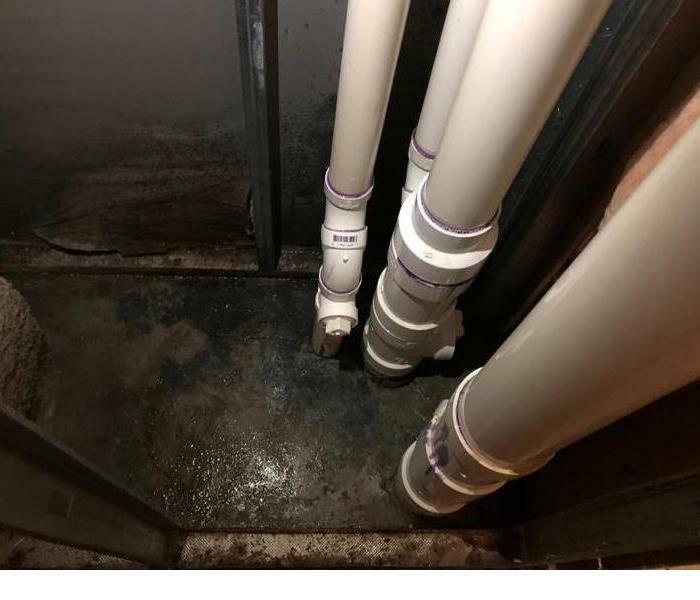 After a leak in this commercial building, they were left with significant water damage. The water had sat and molded over time before found. 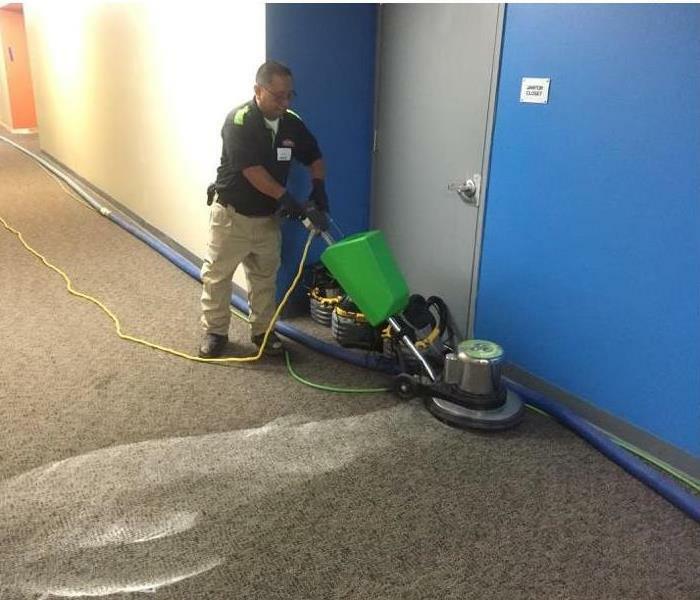 SERVPRO responded and was able to clean the area and restore back to normal conditions. 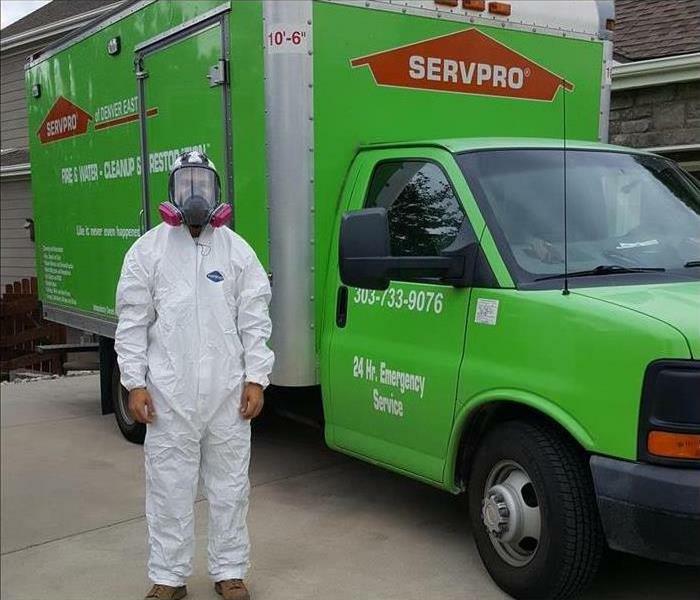 After a water leak, SERVPRO responded immediately to begin mitigation. 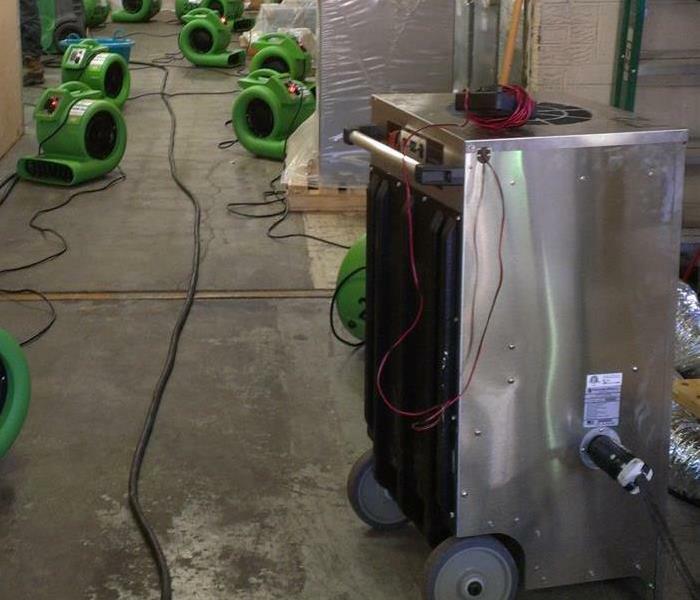 They used professional drying equipment to ensure the area was dry preventing future damages. Contact us for your restoration emergency. How to cleanup soot damage? 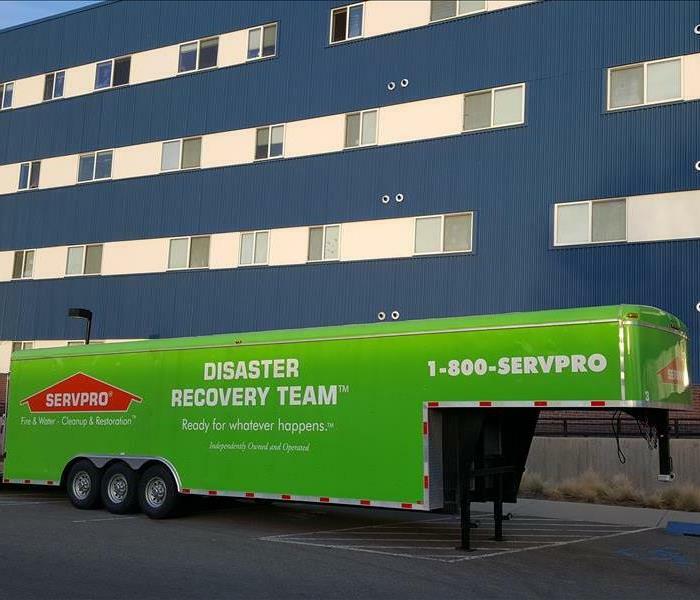 If you have soot and smoke damage in your facility, SERVPRO can help get your facility clean and ready to be open again. If you have any questions feel free to contact us anytime. We will be more than happy to help! What is the best way to clean up after a fire? If your commercial facility has a fire loss, it is important to get a professional restoration company on site immediately. Once on site they will begin the scope and start the cleaning process. 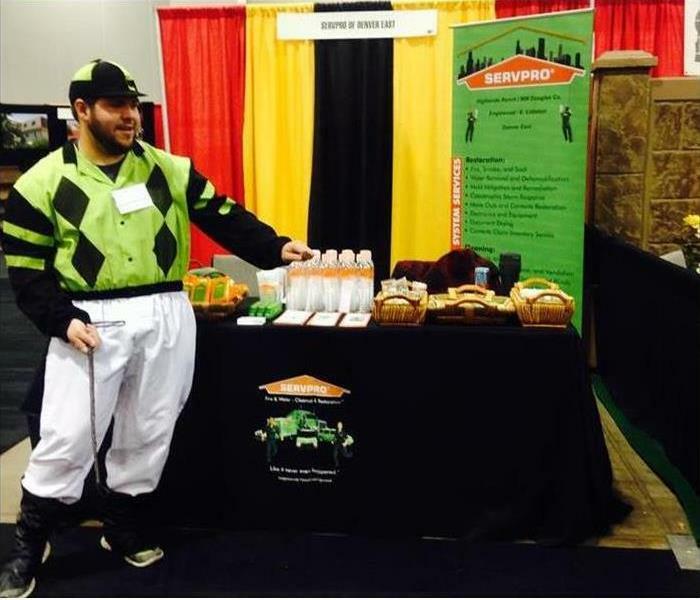 SERVPRO is able to help from start to finish and get your business ready to be open again. We keep a trailer stuffed with equipment just in case there is a commercial building that is flooded. It takes too much time to pack that much equipment for every large loss. 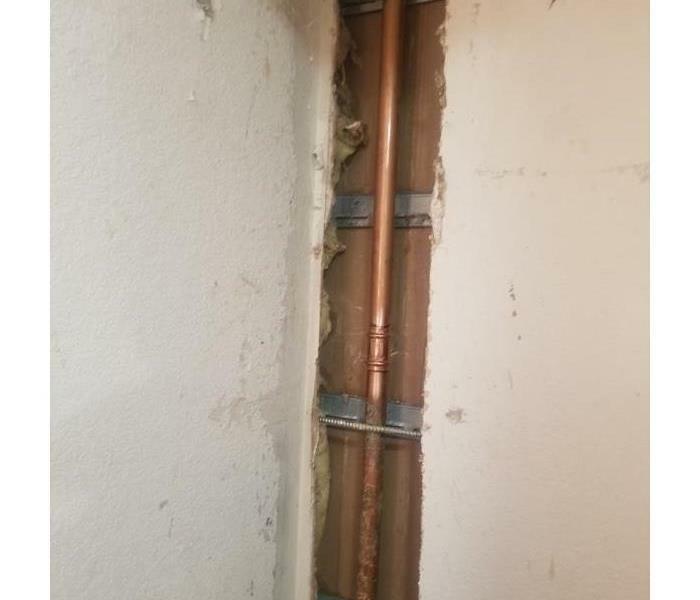 A broken pipe caused a large water loss in this home. 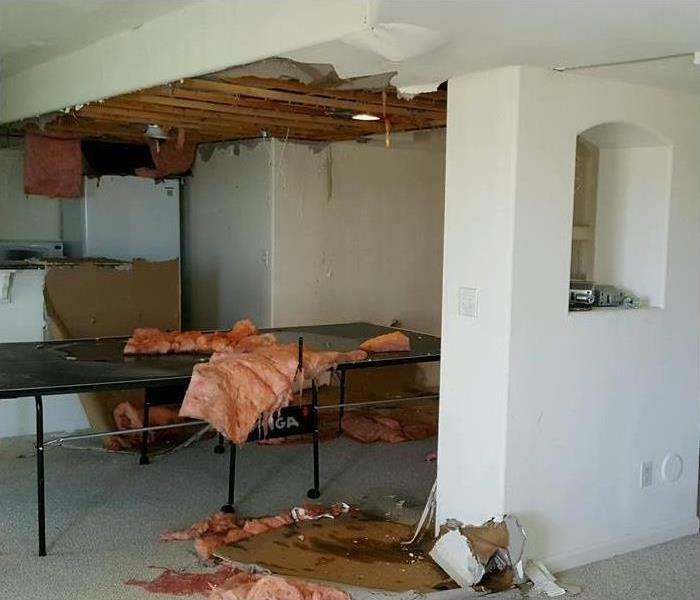 Notice the damage to the ceiling in this image. We removed all the water and cleaned up all the debris. Then we repaired all the damage. The facility in this photo had a large water loss situation that needed fast attention. 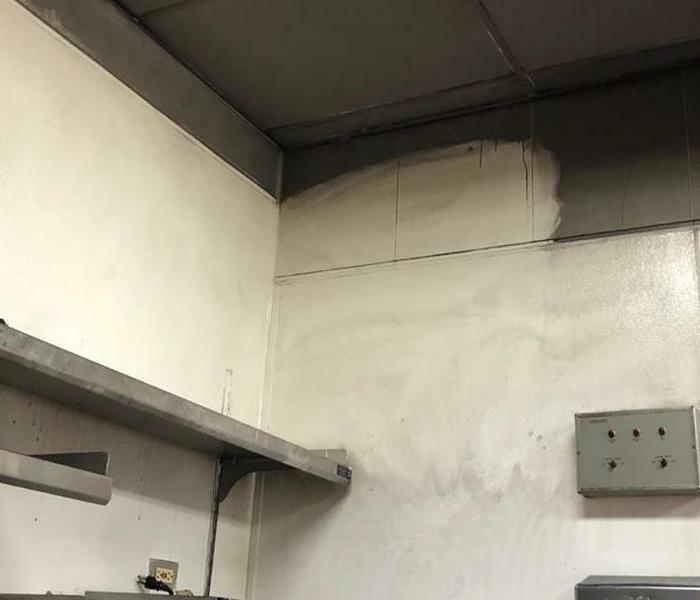 Our team responded to this commercial disaster and were able to address all of the owners concerns and complete the job quickly. This facility was damaged by winds from a recent storm that passes through the area. Our team responded quickly and got started cleaning up and repairing the damage done to the facility by this storm. Recent storms caused flash flooding which resulted in the water intrusion that caused the damage in this photo. 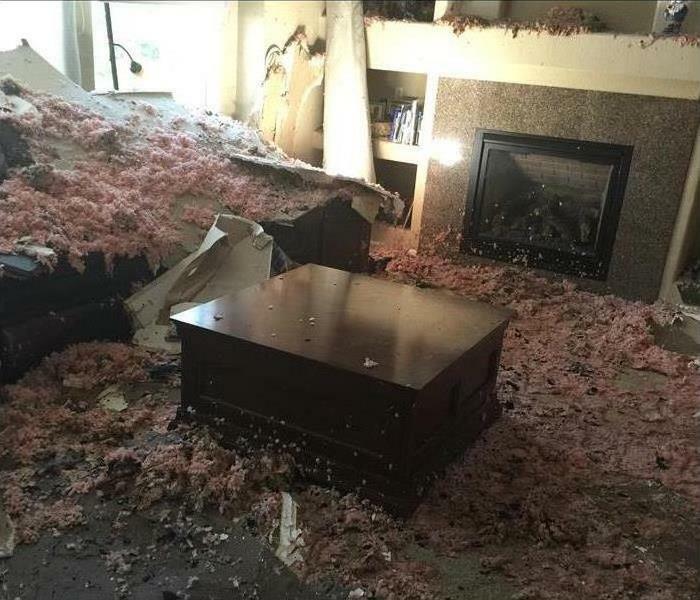 As you can see, we removed the carpet and the affected drywall. After we removed the water we repaired everything quickly. A large storm caused severe damage to a local home. In this photo, you can see part of our team ready to head out to the site to make it "Like it never even happened." We were well-represented at the 2016 CAI Showcase where we talked in depth about preparing for any type of storm that might impact the our area. Everyone that was in attendance responded very positively. This home suffered a serious mold loss and we were called to repair the damage. Our team put all the proper equipment in place, such as this containment barrier, and got right to work repairing the damage. 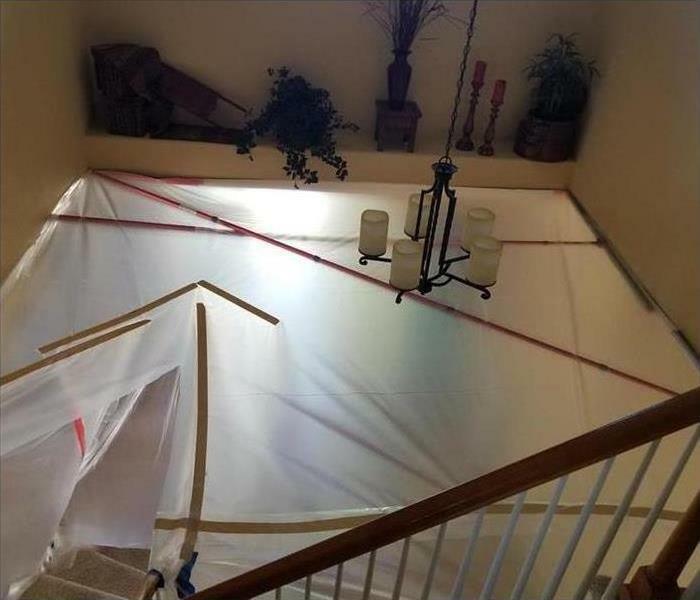 One of the ways we make sure we can mitigate the damage to your home is to make sure proper containment barriers, such as the one you see in this picture, are put into place. This equipment has been placed to help mitigate microbial growth in this mold damaged home. 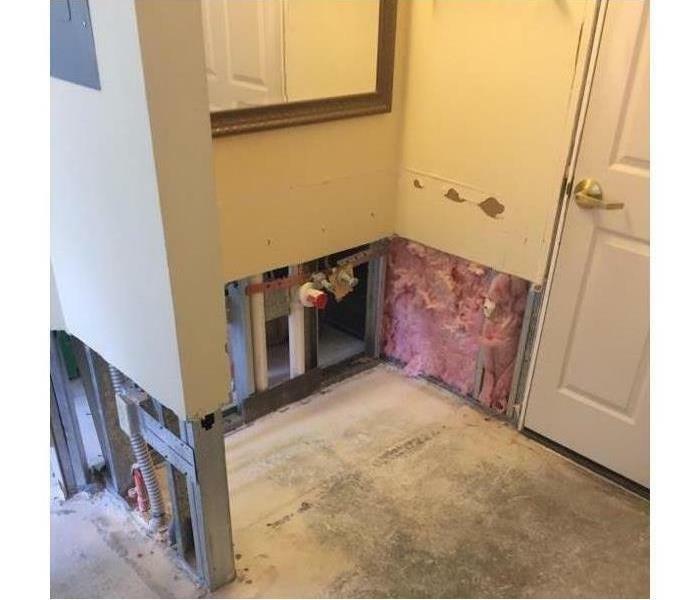 We use every means we can to make sure that when we leave it looks "Like it never even happened." 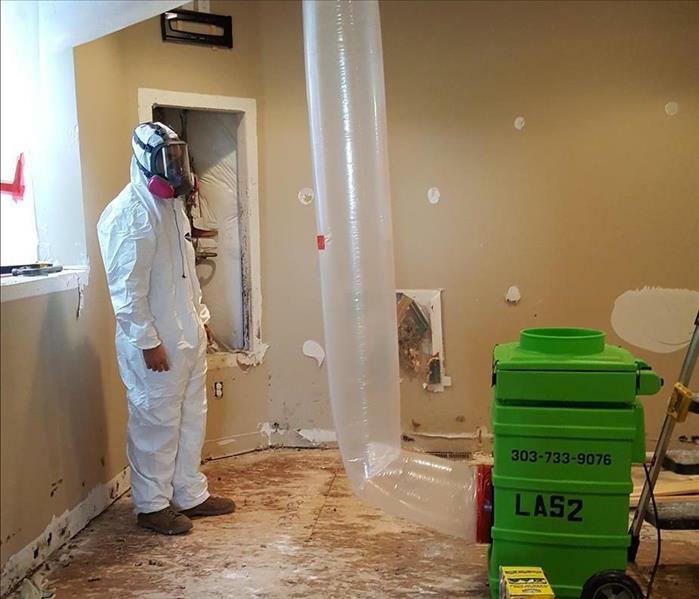 This technician is demonstrating the proper personal protective equipment need when performing a mold remediation. He is about to work in in a home that has had a serious mold loss and make it "Like it never even happened." A large fire did the damage to you see in this picture. The fire affected a large portion of the home and caused similar damage throughout. We were able to repair the damage and make it "Like it never even happened." A large fire that affected a large portion of this home caused the damage that you see in this picture. Our team did a great job cleaning up and repairing the damage the fire did. 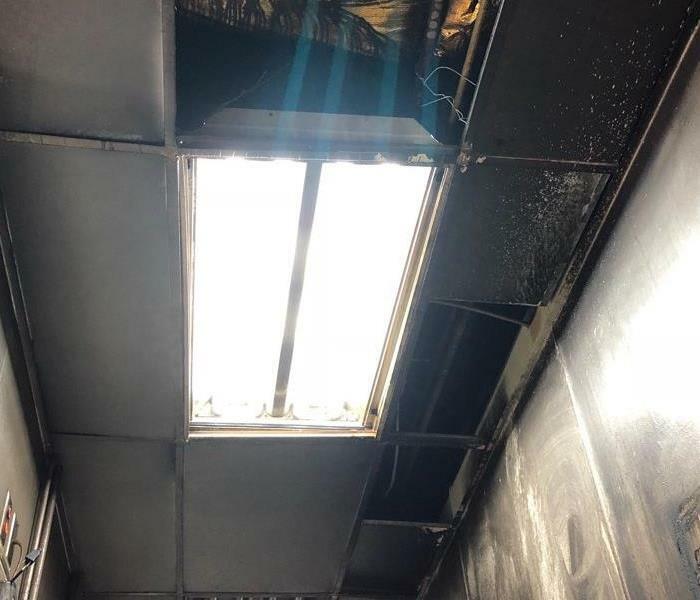 This facility experienced a heavy loss the required a quick response because the owner needed to back up and running quickly. Our team got right to work and got the job done ahead of schedule. This past Christmas, we participated in Elf on a Shelf. 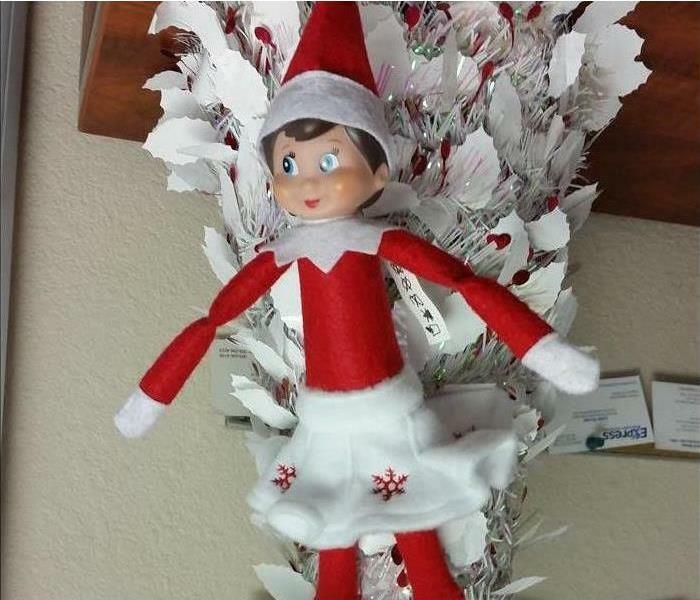 Moving the elf around was extremely fun, especially as our team came in from being on various jobs to find the elf in different places. The Soaring Eagle award is given to companies who represent USAA's commitment to, “Superior Member Service, Quality, and Partnership”. We are proud to work with USAA customers as many are veterans that have fought to keep our country safe and free. Mold is a constant nuisance after a water damage. The damage could come from a broken pipe or excess rain. 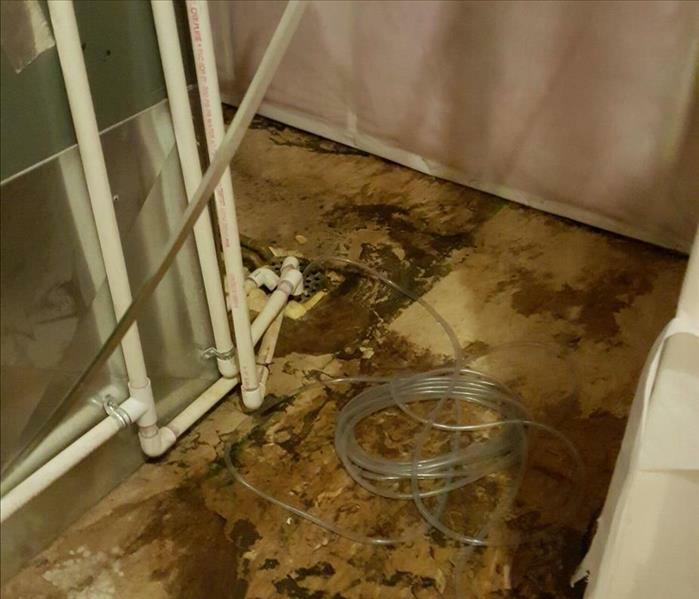 This Cherry Hills Village home needed mold remediation after a water damage. The homeowner was happy to see our professional technicians take care of their home. Carpets are great for commercial buildings and we can keep them looking great. The site and smell of clean carpets make a good impression on customers. Maintaining carpets keep them making a good impression for a long time. Our team responding to a large water loss at a commercial facility. 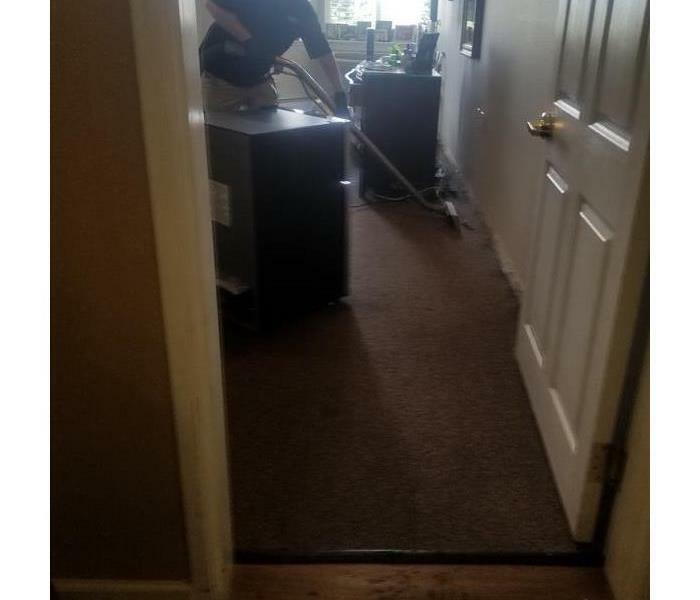 We were able to extract and remove all water. After we placed drying equipment to have it ready to be turned over to the owners. 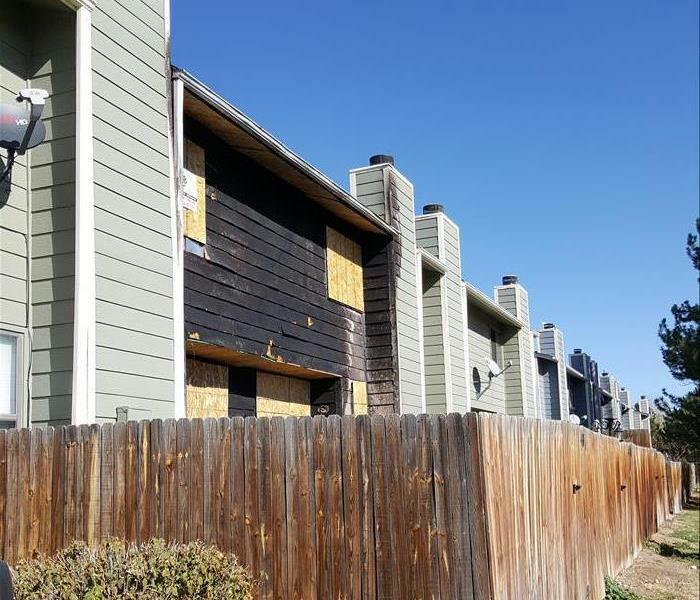 Our team took on another large commercial fire job in the Denver Area. This apartment had a large fire that caused severe damage as you can see in this photo. Our team made it "Like it never even happened." 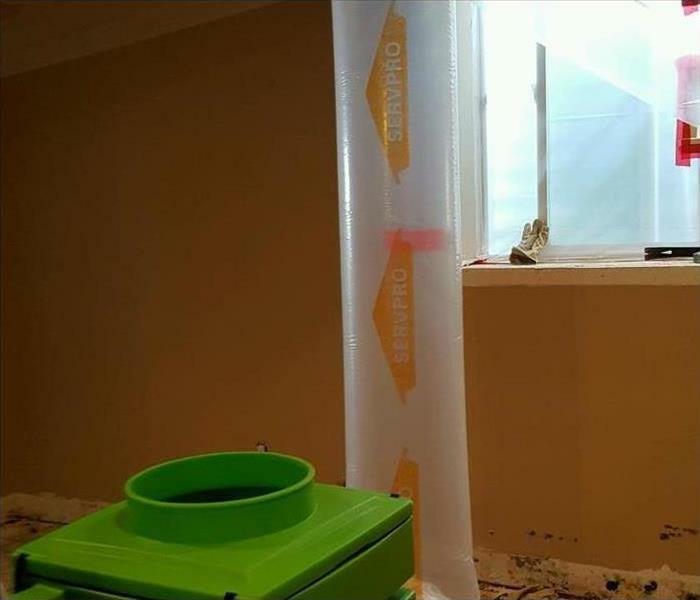 Our team onsite a recent Mold Job in Englewood, Colorado. 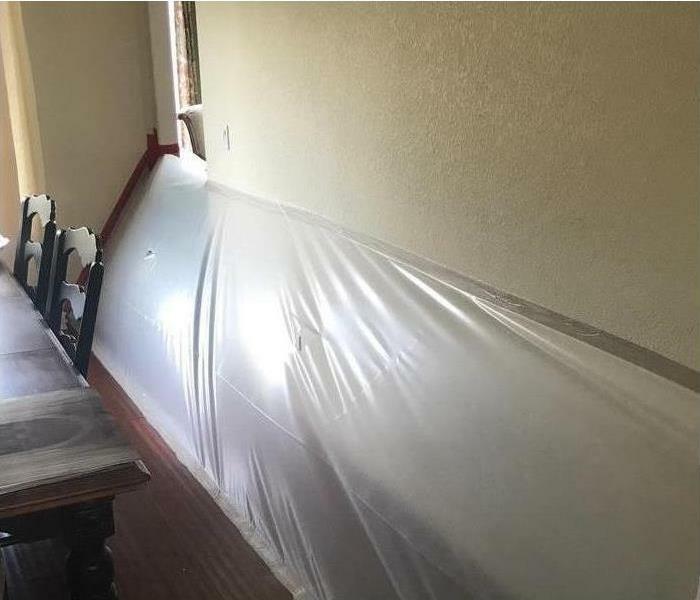 We always make sure that our team can safely remove the mold from your home. We equip them with the proper personal protective equipment as you can see in this photo. 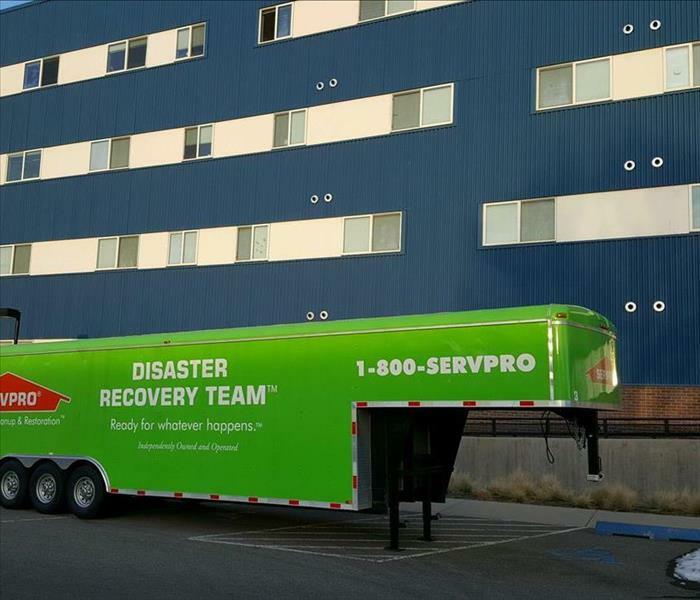 Team Mayfield, responding rapidly to a fire loss in Englewood, CO. Our team can handle any size fire loss in Colorado. If you have any questions do not hesitate to reach out to us. We will be happy to help. 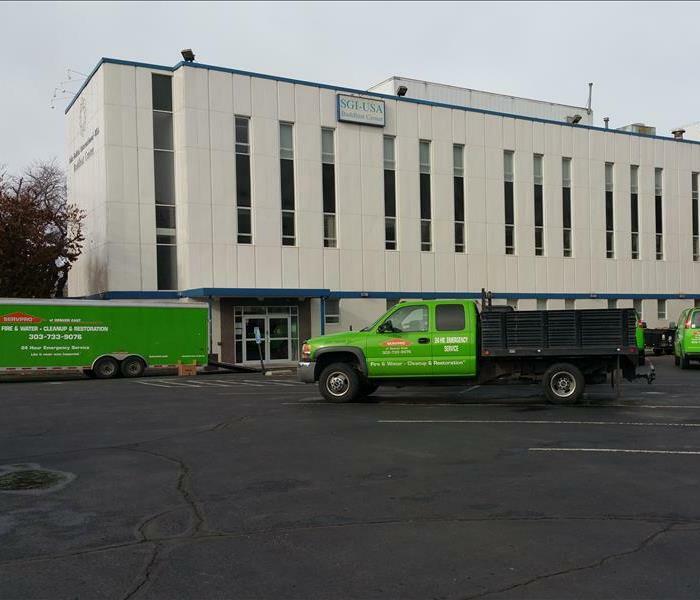 This facility experienced a fire loss and needed a quick remediation to get them back up and running. 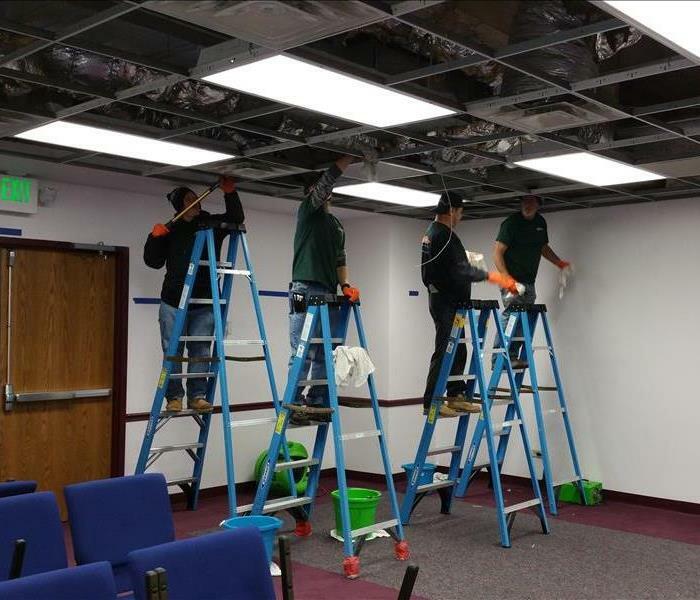 In this photo, you can see our team hard at work to repair the damage caused to the facility. 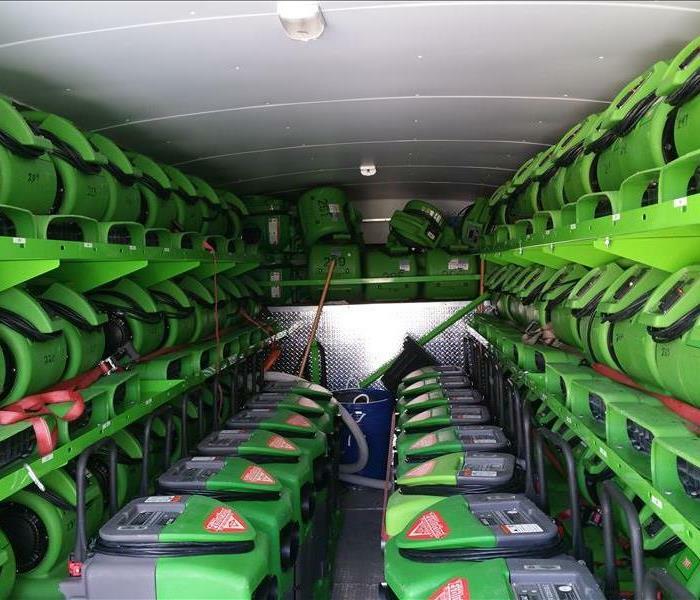 Team Mayfield, Disaster Recovery Equipment Stocked and Ready For Any Size Disaster. This equipment is about to head out on a large storm job at a commercial facility that was damaged during recent storms that affected the area. Team Mayfield, Recovery Team Cleaning Large Commercial Damage. As you can see from the picture, we made sure to put containment barriers and other necessary equipment into place and then we began the cleanup and restoration process. We are honored to receive the 2016 C.E.O. 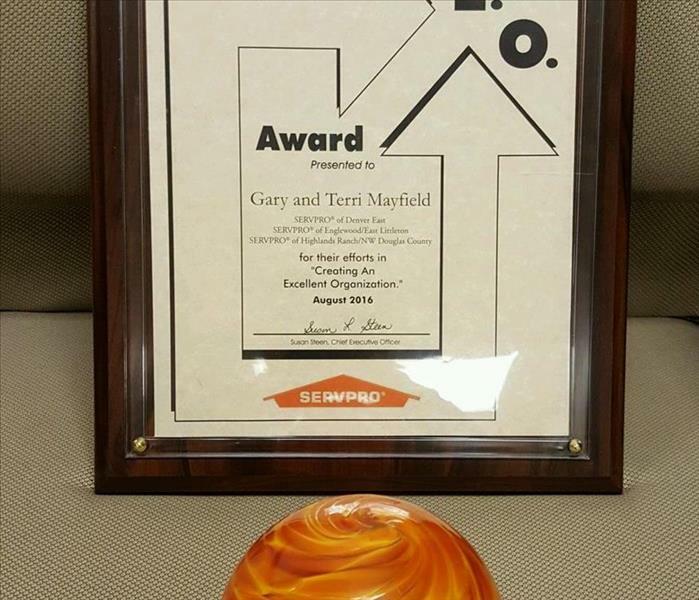 Award from SERVPRO Industries (Creating an Excellent Organization) for our work in providing outstanding service and helping other SERVPRO's around the country. 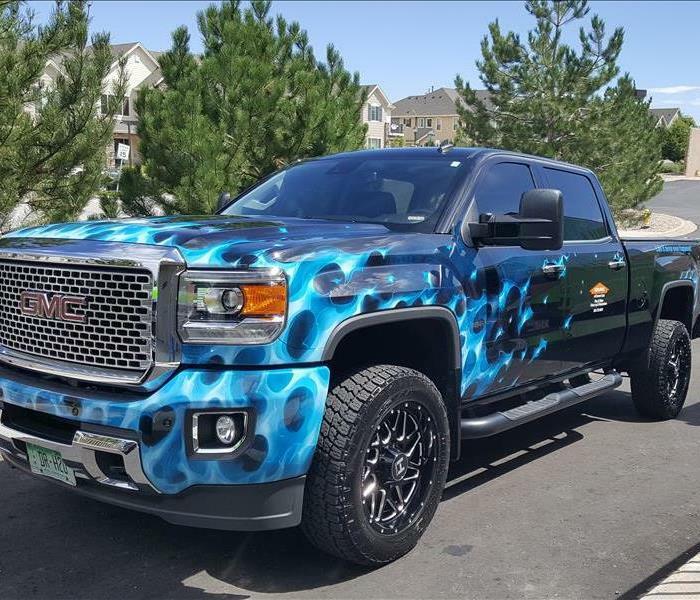 We could not do it without the hard work of our entire team in Englewood and Littleton, Colorado. 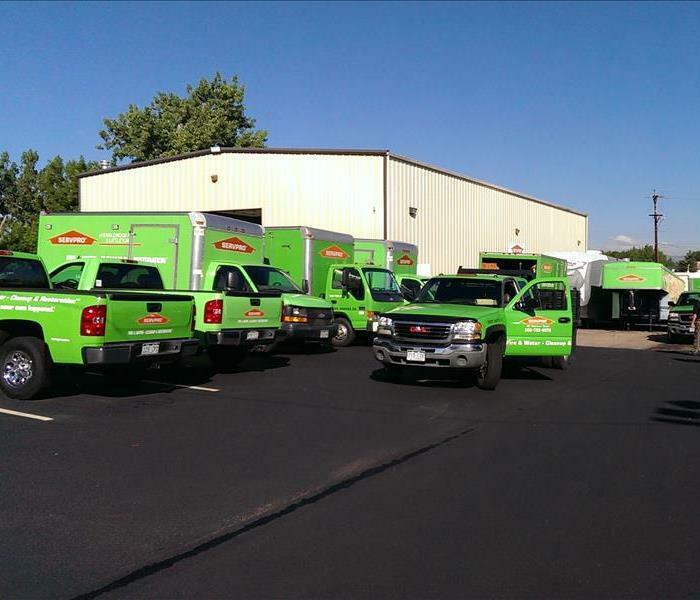 If you experience a fire or water loss in Englewood or Littleton, our team is always ready to go. 24/7, 365 days a year! No matter how big or small, we are faster to any size disaster! Team Mayfield, Equipment at Work! 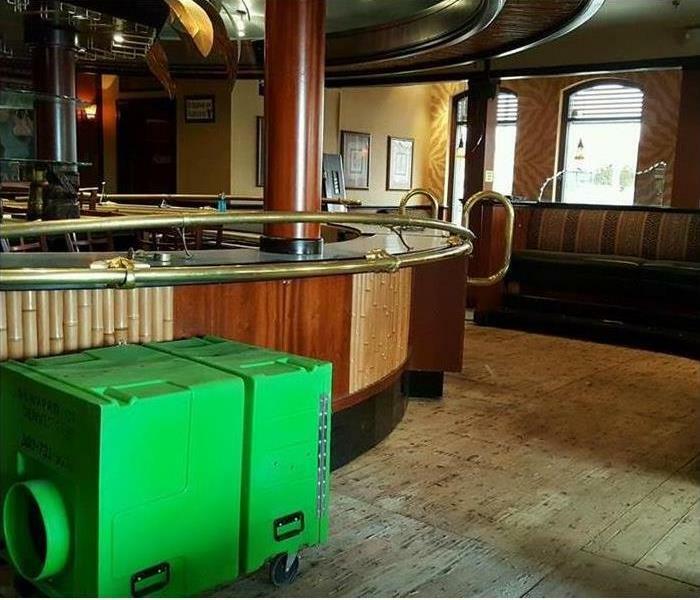 We always bring everything we need to make sure that no moisture is left behind. Here you can see an example of the type of equipment we use to dry up the water. Team Mayfield, In Place Extraction of Water From Carpet at Commercial Loss. 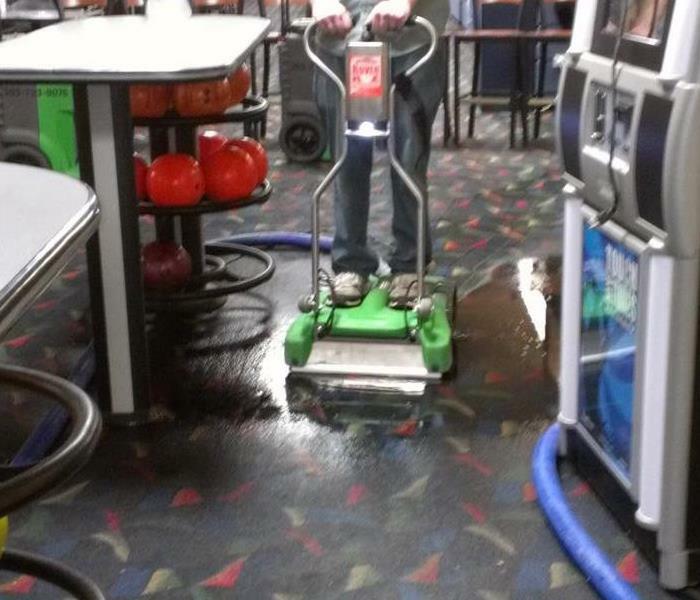 As you can see there was a significant amount of water in this facility. We arrived quickly because we are faster to any size disaster. 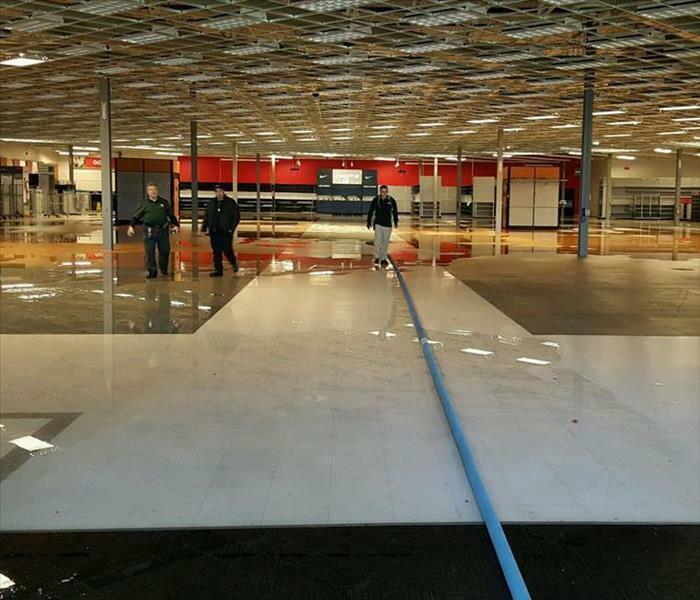 A large commercial facility suffered a heavy water loss situation due to a broken pipe that flooded part of the facility. In this picture, you can see Team Mayfield, Getting Ready to make it "Like it never even happened".